News Splash! Waterproof Printed Products has arrived at Eveready! Eveready Printing, a 115 year old company, owned by father Roger Wolfson and son Scott Wolfson, recognized the need for this unique product. Our first thoughts were that the restaurant and hospitality industries would benefit from this product. Currently, customers are using either laminated or paper menus. The downside to laminated menus is that they can be bulky and the lamination can peel. Paper menus have to be replaced constantly due to rough handling by customers, which in turn require the restaurants to print large quantities. Google and Print advertising is a debatable topic. With the plethora of online marketing channels that companies can use, why should a company print marketing materials anymore? There are several reasons why, and the proof is seen even among the top internet marketing channels themselves. Google is the SEO (search engine optimization) master, to which all website creators try to appease in order to have their pages indexed and placed on the top pages of the search engine. Google ratings are very important to merchants online and offline. Free and pay-per-click advertising as well as paid ads are available to the public. Google is one of the biggest online marketing channels in the world….and they use print marketing. 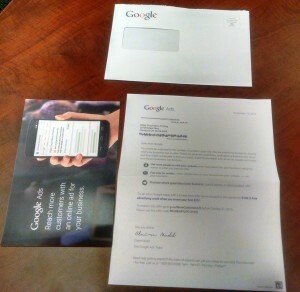 Google recently sent marketing mailers. 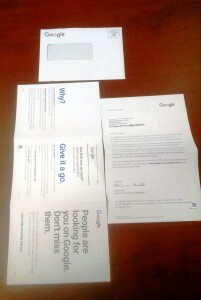 The mailers included a letter accompanied by a promotion code brochure, postcard insert, and credit card which was promoting a special for AdWords. The letter explained how AdWords worked and how it could improve business. The card was very eye-catching, printed in a bright blue with big, bold print. The back side of the card had a step-by-step guide and all the information the recipient would need to take advantage of this offer. Why does Google spend money to send out printed information when they could advertise within their own search engine for free? Google understands the power of printed marketing materials. Online advertisements often get overlooked by viewers because internet users have been bombarded with online advertisements for years. We have essentially been desensitized to online marketing unless we are searching for it or it peaks our interest. Even if a consumer notices the Ad, their retention of the information is going to be limited, even if they click on it for more information. By clicking on an ad, the web user will be taken away from what they originally came to the page to do and therefore unlikely to click on it. With printed marketing materials, this inconvenience is eliminated. Google also understands that quality information cannot be summed up using a banner ad. The amount of information shared in the letter I received from Google would have been too much to fit on an online advertisement. 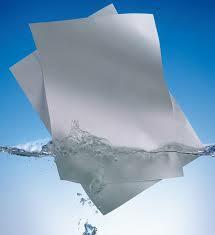 The letter contained useful information that spoke to the quality of the service they were promoting. The more credible a product/service, the more likely it will sell. Google knew that making their marketing campaign personal would catch the reader’s interest. The offer advertised required a promotional code to redeem it. The card sent in the mailer contained that code. The code was mailed to me personally; it is more like a personal invitation rather than a deal offered to everyone on the internet. There are many ways to make a printed Ad feel personal to your customers. Mailers are a great option. The recipient will save it, and when they see it again your message will continue to be redelivered. We can help you conceptualize and design a printed piece that will keep the impression count adding up. These are some of the reasons why Google uses print advertising. Print is alive. If you are interested in using print marketing techniques such as letters or postcards like Google, visit our websites Eveready Printing, We Print Quick, Water Proof Printed Products, and Cool Marketing, and see all the innovative ways you can use print. Start to Advertising with We Print Quick Put down your phones, stop tweeting and sharing for a moment, and let us talk about traditional marketing. Print marketing may have taken a hit with all the advancements of smart phones, tablets, and the internet, but it has proven through the years that it is still effective and continuously relevant. Even now, millions of postcards, flyers, business cards, are still in circulation all over the world and bringing business to mega corporations and small businesses alike, and it doesn’t take much to realize that print is still a very valuable marketing tool. All you need is an understanding of how modern marketing operates as well as a few simple tips. The difference between an actual letter and an email is that you can physically hold one in your hand while you can only look at the other through a screen. And while everything nowadays is all about mobility and less waste, there is something different with something that you can touch, feel, and smell as opposed to mere pixels. A lot of people, for example, have created some very unique and memorable business cards such as business cards that can be used as puzzles, wrenches, and even refrigerator magnets. This shows resourcefulness and inventiveness while at the same time highlighting the fact that all digital business cards are useful for are to look pretty and to burn battery life. There is no changing the fact that printed materials take up space and can be bulky; what you have to do is to turn that around so that it works in your favor. Print’s Not Dead. The phrase may be a cliche. But it is still valid. Print’s not dead. With the creation of the internet and the surge of social media, it is more vital than ever to create marketing that is still unique and captures the attention of your designated demographic. Some people believe they should put all their efforts in web ads and web presence but they are overlooking the importance of good old print marketing. When you meet a potential new customer, what first impression does your marketing material (brochures, business cards, letterhead, flyers etc.) give to a potential customer? Do they scream small business with limited resources? Are they out of date and suggest that your company doesn’t keep up with a changing world? Take your marketing efforts to the Next Level! Having the right printed marketing material can make a huge impact on how your company is perceived. The right look and feel of your company’s brochure, business cards, letterhead, envelopes, and direct mail pieces communicates the overall quality of your company and helps your collateral stand out amongst your competitions. Let Eveready Printing Help your with your companies first impression. Eveready Printings promotional products are “articles of merchandise (often branded with a logo) used in marketing and communication programs that are given away to promote a company, corporate image, brand, or event.” Use promotional products to your company’s greatest profit-by first understanding the benefits. 1) Eveready printings Promotional products increase your company’s brand recognition and brand awareness through repeat exposure to your company name and the products and services offered as displayed on the promo product they received. 3)Promotional products reach a crowd of people at a low cost per person which inevitably increases the reach of your company and its brand. The mass of people will include the people that received the distributed promotional products and anyone the receivers interact with that come in contact with the promotional product. The reach of your brand through promotional products can be exponential. 4) Recipients tend to hold on to tangible reminders longer than any other form of advertising. The greater quality promo product you supply will present a better impression of the quality of your company’s products and services. And the longevity of that product will continue to influence the recipient for as long as the product lasts. 5) Recipients of your promotional products will see your company in a favorable light. By providing something free it shows potential customers your goodwill and begins to build the trust necessary for a great business relationship. 6)Promotional products reiterate the work your company is doing through other advertising sources by confirming that your brand is available and the people easily accessible. 7) Studies have shown that your trade show booth traffic can triple by including a promotional product in your pre-show mailing. It is also beneficial to have a promotional product at your booth so visitors to your booth will remember your company with a tangible representation. 8) Some promotional products can represent a form of business card as it displays your company name, logo, and contact information which provides easy access to the information needed to contact your business. 9) Not all promotional products are created equal. Evaluate your target customer and the purpose for the promotional products in order to choose the most effective product for the opportunity. You are now informed about the benefits of promotional products for your business and are ready to tackle sales growth through this low-cost, high return on investment advertising tool. As you determine how best to use promotional products, keep in mind that people like free stuff and so will you when you receive additional sales. Design templates have made making your own printed creations – whether for business or pleasure – a fast and easy process. No longer limited to the trained graphic designer, today anyone can download design templates to make postcards, business cards, brochures, flyers and rack cards. Below are ways you can learn why design templates make for fast, professional designs and what you should look for when choosing a design template before you decide to use it for your project. One of the greatest things about these design templates is the fact that they can be quickly customized to promote your company or share your events – all without sacrificing the quality of excellent graphic design. Choose the template, some quick text and/or photo, and you’re ready to get your project printed. This not only levels the playing field for individuals and business owners, it also lowers budgets for businesses and makes last-minute emergency projects a snap. Choose a good online printing company that would have plenty of templates for you to choose for your project and would turn them into wonderfully beautiful printed creations. With premium paper stocks, glossy and matte finishes, and professional-grade inks, you can get a completed professional printed product at a price that is cheaper than what it would cost to have a graphic designer to design your project. Better quality means a better impression on customers – and when it is so affordable you can’t lose. First and foremost you have to love the design. The design should be professional-grade and should match the colors of your business , the mood of your personality, your event, and your customers. That probably goes without saying; however, there are other things that make for a good design template – and you would be wise to double-check that your online print company template meets these requirements before you commit to it. You should be able to edit your template, which means it needs to be user friendly with training tutorials should you need them. You should be able to view your work and request a proof before committing to print the project. 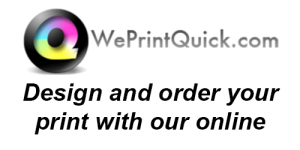 The Online Print Company should also have a design team available to give you support when designing your project. Most important is to ensure that your chosen design templates are the correct size and are available in the proper color mode (CMYK) and resolution (at least 300 dpi) to ensure that they are print-ready. Choosing the right Print Company will save you plenty of headaches and money down the road, and essentially helps you get the best quality finished printed pieces at the most affordable prices.